Glad to let Green Humour readers from outside of India know that I've set up a Redbubble store for international orders! 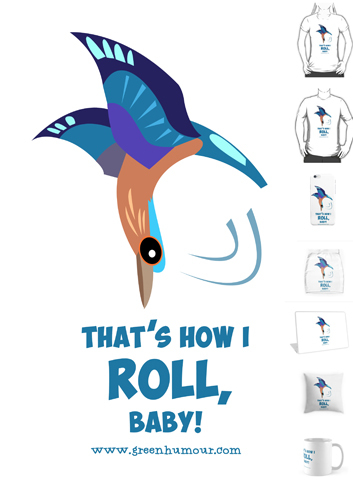 Here's the Indian Roller t-shirt I designed for my previous exhibition, Wildlife the Toonie Way, which is now available from my Redbubble store here, along with the CHE (Crested Hawk-Eagle) t-shirt. The artwork is also available as an entire range of goodies that includes mobile and laptop skins, mugs, pillows, tote bags and diaries. The illustration depicts the courtship display of the Indian Roller, in which the male performs somersaults mid-air to attract a mate. More designs coming up soon! Wow! First of all I cant able to see what kind of image it is. 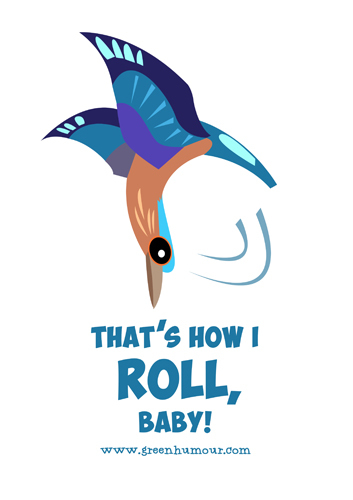 After looking closely to the image i came to that a bird is rolling down.